Anderson fans should look out for the latest issue of Model Collector on Friday 15th September, which contains a special feature on the upcoming 50th anniversary of Captain Scarlet! 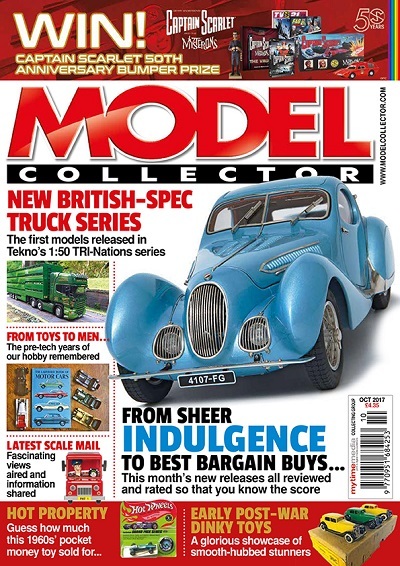 Model Collector is THE publication for the die cast model enthusiast in the UK. As you can see from the cover there should be some great Capatain Scarlet prizes on offer. Perfect reading matter to get you in the mood for Special Assignment at the end of the month…don’t you think? This entry was posted in Merchandise and tagged Captain Scarlet, Model Collector by admin. Bookmark the permalink.